Yellow is such a wonderful boost to my overall state of mind. The light was dim, but the top was the sun. I needed something quick to sew to get me over this hump with all the other fitting work and projects I have been working on. This was a really quick top to make….actually it was all of 1 hour, and that was because I had problems with the stitching because I was too lazy to actually change the needle to a “stretch” needle. Of course I know better, since I did write a tutorial on sewing on knits…here…go figure. “Do as I say, not as I do, right?” OOOps. The wind of course was giving me a task of this small little photo shoot. I just pulled over to the side of the rode, set my tripod and let her rip while I talked on the phone to my fellow sew-sister, and friend, WendyByDesign from Detroit, via FaceTime of course. That made the whole deal more fun, since I do become somewhat shy about taking pictures in public…you gotta believe me, I am really coming out of my shell for y’all. The folks looking out the office window really were have a time with my escapades. I have so much appreciation for those bloggers that get out for their pictures time and time again. Well that for them and this is for me…I hate this type of thing. But, like I said it was a lot of fun. This is the second time making this pattern, the first time was here without the sleeve. The fabric was a nice gift from another sew-sister, Cennetta at The Mahogany Stylist. It’s really nice meeting such wonderful people all over the country and world. I don’t particularly have any folks in different countries yet to call on, but it in the works. The pattern is literally shaped the exact way it looks. I did a small fba on the front left “bust” so it wouldn’t pull to the side like in the last one. Amazing how much of a difference it makes. I will definitely be making this again. I am head over heals with this “t-shirt” top. I made this skirt almost 3 years and ago! Where has it been? I had all but forgotten about it until I saw RedPants Designs make her version, now I need a fancy jacket to wear with it in cold weather. It was all the way back in my closet folded over a pant hanger behind a few other items I just wasn’t interested in wearing. 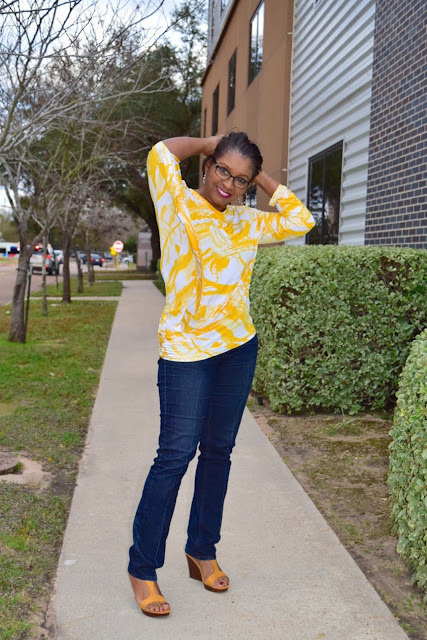 Also, since I have been parsing my closet and checking for “holes” in my wardrobe, with the help of my trusty styling and wardrobe planning blogs, a few fun outfits I made in the past have been resurfacing. A goldmine to my surprise. 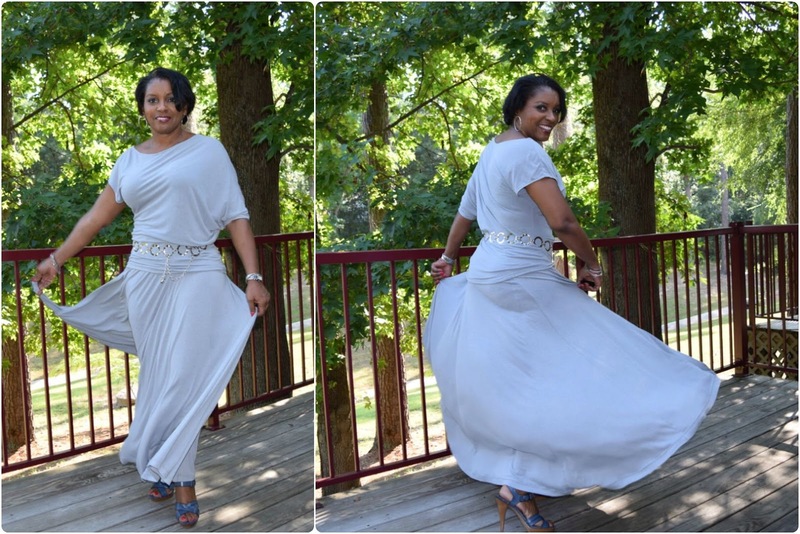 I was so happy to adorn this fun skirt that I had to take a twirl or few. I was having so much fun twirling, I felt like a kid. 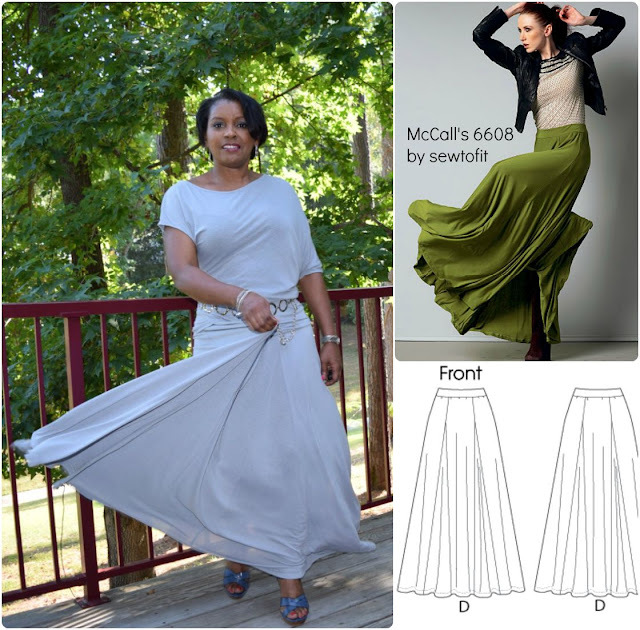 This skirt is from the McCall’s 6608- Misses’ Skirts. I made it from the lightest and most difficult of rayon jersey knits out there, at least I think. It required 4 yards of fabric and I wanted every bit of that fabric in this skirt. 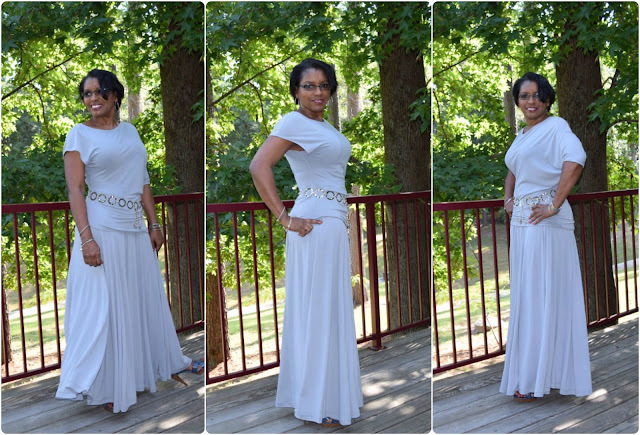 The drape is sublime and you would never notice it has so much volume. Hence, the reason for all these twirling pictures y’all. Oh, here are a couple with the skirt just hanging gracefully to the floor. Doesn’t it make me look taller? At least I feel taller wearing it…and with this top I made at the same time McCall’s 6400 creates a really fancy monochromatic look that I like. 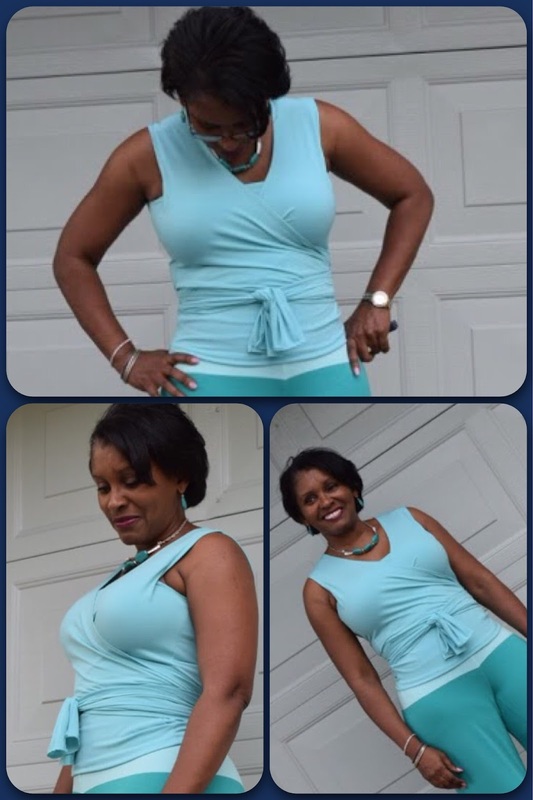 I did try this top, just recently, in a heavier knit to go with my palazzo pants…but it was an epic failure. The skirt has 4 godets, and is voluminous to say the least. I would say it is much wider and fuller than the average circle skirt given that the godet insets add so much. Be very careful of your fabric choices, this skirt will grow longer and longer and longer over time from the weight of the fabric and the bias cut of the parts. I have mine pulled up to my ribcage since my heels aren’t very high. For the waistband, I used 1.5″ elastic, and could have gone down quite a bit on the length of the elastic. I got the elastic from Peggy Sagers with Silhouette Patterns. I have since found a pretty good one from Lyla Messinger as well. It helps to keep the waist area extremely smooth and is used in yoga pants. 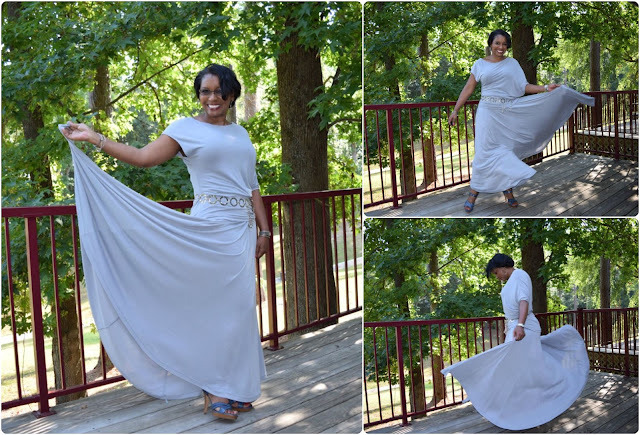 I styled it with a simple t-shirt here…which maybe, I will add another type of shirt to see how versatile I can make this maxi. Of course I will be making another one but somewhat shorter to wear with boots. We shall see. Most of the time when I want to grab a simple pair of jeans and a t-shirt I end up with over stretchy, graphic and just blah-zay. I need some basics so that when I want to dress basic, I’ll have something to wear. It was extremely hard to make this one plain and simple t-shirt. 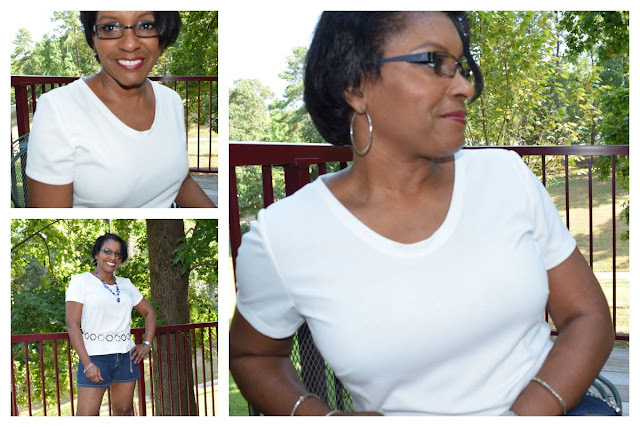 No color, no patterns, no prints, stripes or fancy seams, just your plain ole’ t-shirt. That is what this is at first glance. But all the stylist and wardrobe planners who I consult, in books, online or InRealLife, tell you to make sure to have “the basics” and you will “always” have something to wear no matter the occasion. Thus, I have set out to make some basics, and I started with this T-shirt. I’m told the next on my list of makes should be a White button down dress shirt/blouse, a good “day dress”, a black jacket with pencil skirt, a dressy jacket (this is where the Chanel-like jacket fits into the plan.) a Little Black Dress, a pair of nice black dress slacks, and well fitted jeans. From this arsenal, I should be able to run to the closet and mix-n-match a manner of outfits just by adding choice accessories and colored pieces to match any season, spring, summer, fall, or holiday. Pairing it with shorts or a nice skirt changes the entire ensemble from casual to business. So, there, is it really just another ole’ t-shirt? I think not. I just need to wrap my head around the idea of making the simple pieces needed to build a versatile wardrobe. 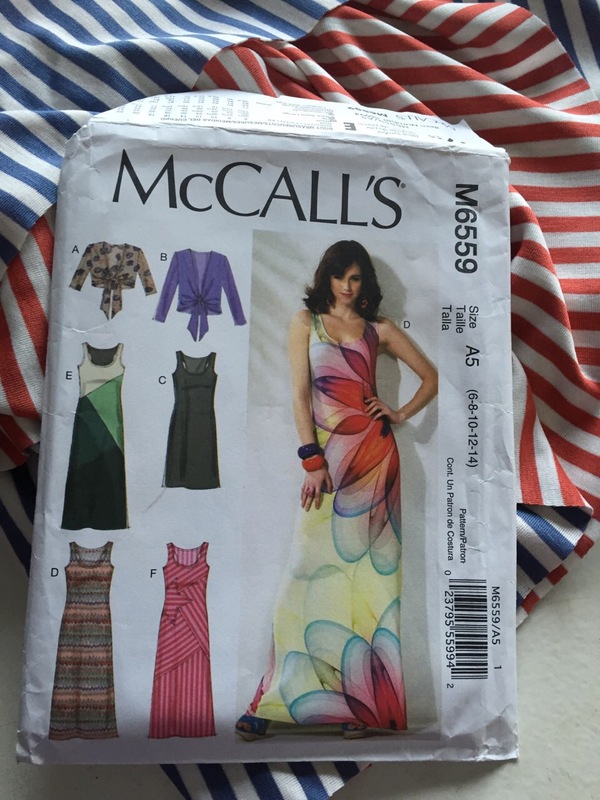 McCalls 6355: view C, I cut a size 16 based on the finished bust and graded the shoulders, neckline, and sleeve cap back to my normal size 14, including added 1/2″ at the shoulder/neckline to narrow the opening, it was way too wide even for the size 14. The short sleeves were lengthened 1.5 inches from the pattern. I lowered the front neckline by 1.5” and lowered the bust dart by 1” and angle it up a tad to taste. The fabric is ponte knit from Hancock, so it only has 25% stretch. Next one I will lengthen at the hem another 1.5” or so, it falls just a teeny bit to high on the hip or maybe just take in the side seams. We shall see what happens with a different fabric. I follow a lot of “idea” cites and get wardrobe planning tips from various sources all the time. What are some of the special places you all check to help you sew with a plan or purpose? 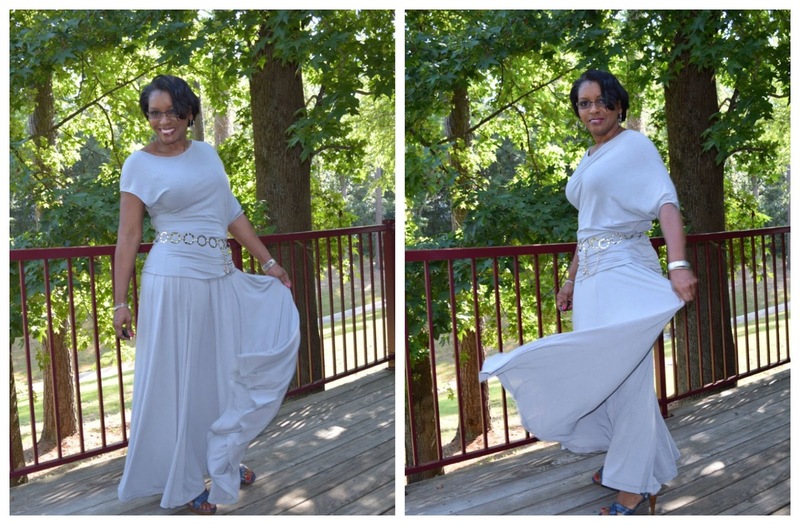 I love palazzo pants just as much as I love maxi skirts. 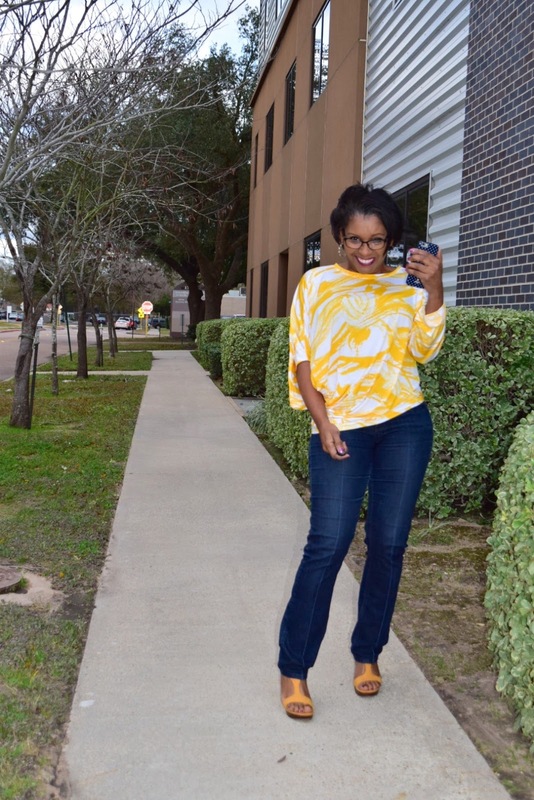 Jeans are not on my radar during the Houston summers. 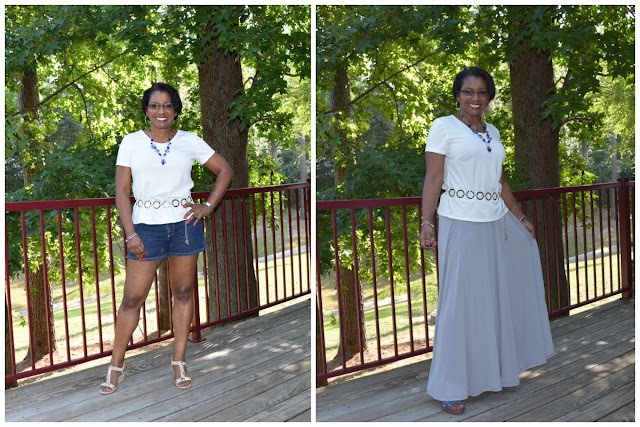 Only dresses and shorts are my summer attire…but occasionally, when I really want to relax modestly and still feel dressed up enough to go out in this heat, lightweight pants are great. In this case, the palazzo pants do the trick. There are so many different patterns on the market for palazzos, but these sort of went under the radar for such a long long time. As a matter of fact, the envelope even screams “boring.” I spend more time opening pattern envelopes and reading and studying pattern pieces, than I care to admit. I just want to see how they are designed, because that is my nature, never take anything at face value, and always look under the hood. I always knew making leggings were easy to sew up and finish quickly. 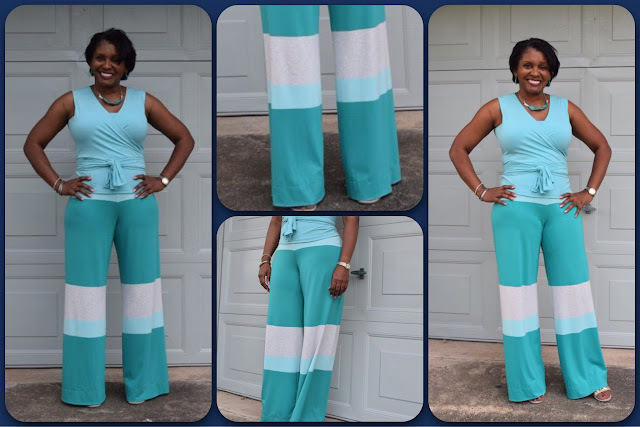 So what does these palazzo pants have in common with a pair of leggings?– They do not have a side seam, and there is only one pattern piece! Gotta love simplicity, right? This McCall’s 6571 is a hidden gem, but not the first of its kind. 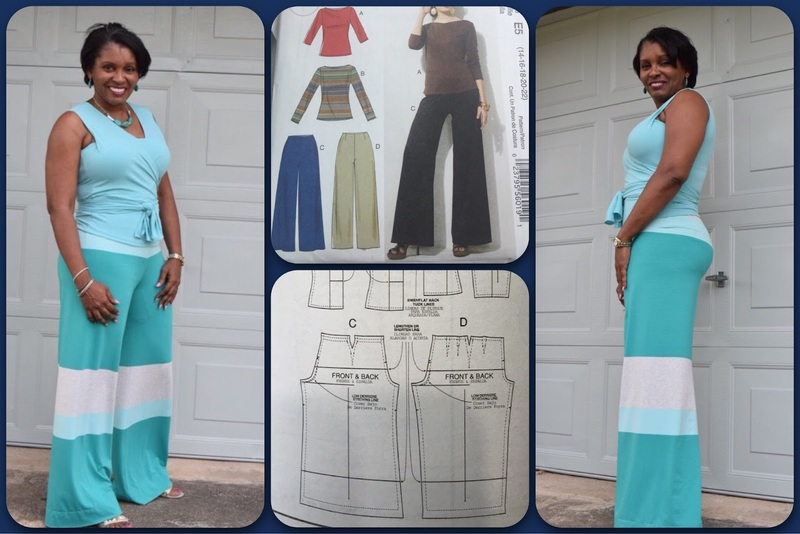 After a little research, I found another pattern from the same company “McCall’s Pattern Company”, a Vogue 2064, a really nice tunic and “wide leg” pant pattern. They can be done up in a knit or woven fabric. Both need to be light draped fabrics though. The pattern made for woven fabrics come with extra darts for shaping the hips and waist, and includes an invisible zipper. The knit pattern piece has darts on the side only at the waist for that final tweaking of the waist shaping, along with an elastic waistband. I made them extra long and added a 2.5″ topstitched hem for the look to balance out the stripes. The pattern is listed as a Palmer/Pletsch pattern because of the helpful adjustment lines available to assist with making fitting alterations. These fitting lines help you to make size and fitting changes in areas common for most people when using commercial patterns. 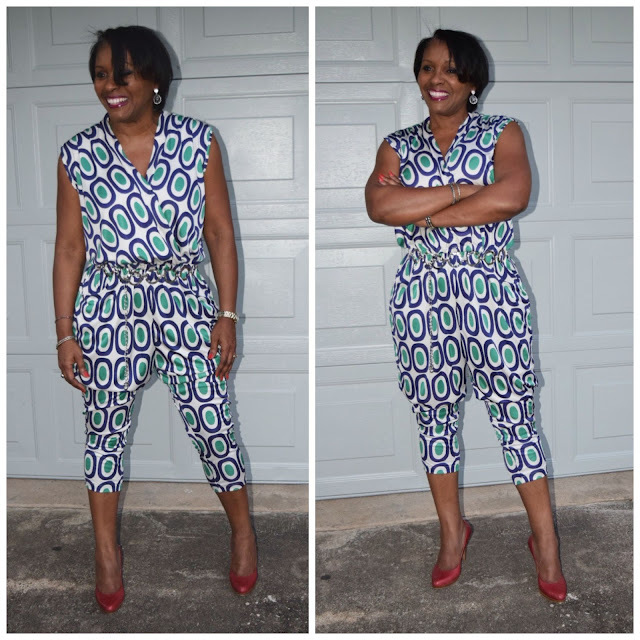 Mainly, these adjustments include crotch changes and lengthen or shorten lines. The width is done down the side seam in most pants, but in this pattern, you would just increase the back crotch width or the front accordingly. I like this pattern because, it is balanced enough to allow for stripes to remain horizontal with no skewing like what happens with regular leggings. This is because the inseam (inside leg seam) is straightened, thus causes the pant leg to hang straight on the grain. Cut size 16 with a waist size 14. Fabric Details: A nice beefy cotton jersey knit purchased in New York. (New Yorkers are so lucky.) This fabric has a 32″ repeat…why do I do that to myself!?? The matching striped was begging to be purchased at the same time, although I just can’t seem to pull together a good look for it just yet. I tried a making top from the small stripe, but it just did not work. My instagram friends said, it works for two separate looks, but not together. Blouse: I originally made this blouse (The Graffiti Wrap Top) from the 01/2008 Burda Style magazine here. I just decided not to place the sleeves on this version, and folded over the sleeve opening’s and stitched using a zigzag. I can see the underlay pulls at the armhole giving it a really cute angle detail at the armhole. Later I will try and figure out the problem, but for now, I kinda like the look. I used a matte jersey to make the top, its really nice and cool even in this weather. All-in-all, I am working on so many different looks right now…so getting back to another top from the same pattern within months of each other must mean I really must like it. As for the pants, I will be pulling together another pair to wear with a cute tunic I’m working on currently. 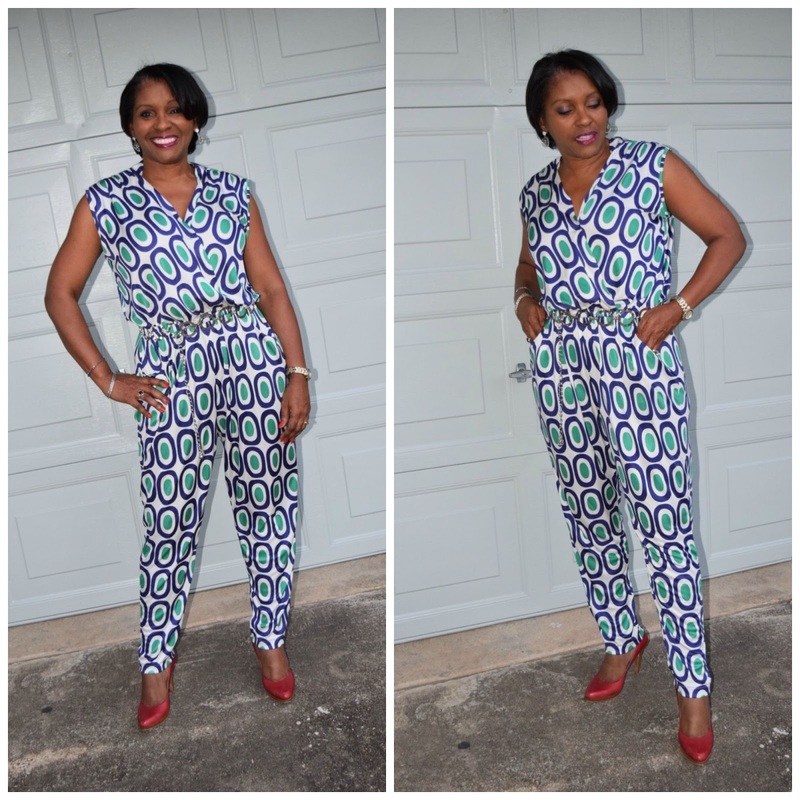 Review: McCall’s 7099- Jumpsuit craze, I’m feeling it. I seem to have latched on to this jumpsuit trend. I can’t get over how well put together you can look in one easy swoop. No guessing, the same as with a dress, yet legs covered. All that wrapped into one piece. Who knew? Stylist are kinda smart I think. They pay attention to everything, so people like me can pick and choose any of the latest designs to match our style and taste. In this case, I have been trying out some new shapes. Shapes I wouldn’t normally gravitate towards, were it not for this website, “Who What Where” giving me fantastic ideas for every occasion and taste. 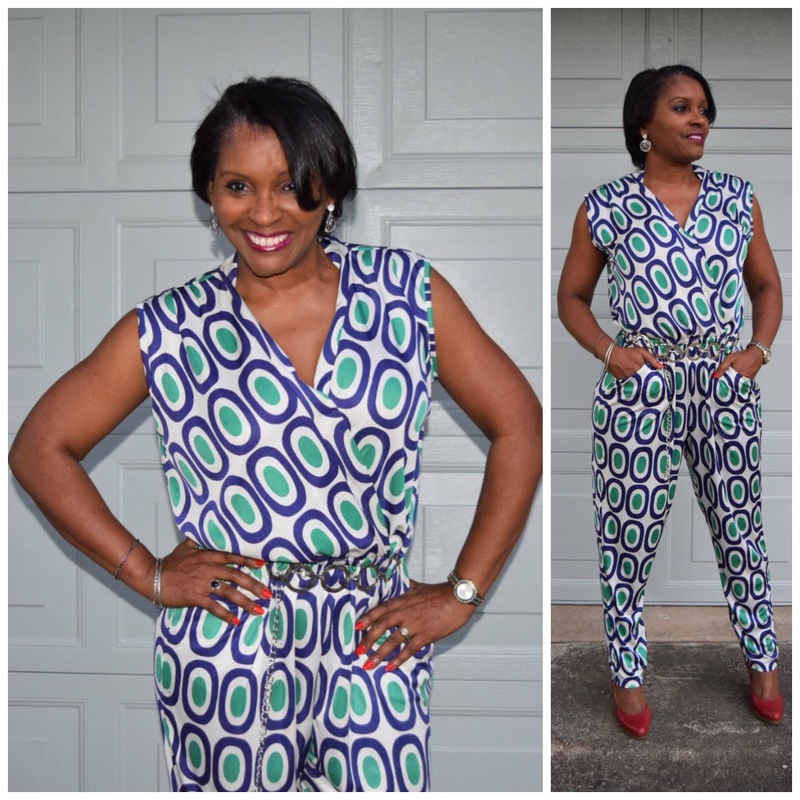 This jumpsuit can even transfer into a little “Hammer Time” action. The fabric is a lux silk jersey I got from New York on my vacation back in April. This fabric feels awesome, and ooh so comfy. I can wear this jumpsuit dressed up or just lounging around the house, it’s just that comfortable. I didn’t know silk jersey sewed up so nice and easily. Topstitched the channel for the elastic instead of just having it hang loose inside. The bodice is extremely loose fitting…I even took out some fullness in the back so I wouldn’t look like a quarterback. This does make it a little more challenging to take on and off, but its better than it just hanging on me like a clothes line. Shoutout to my daughter for styling my outfit. Red shoes, I feel so Dorothy! Y’all know I would have never, ever!! considered red shoes with this outfit. So very cool. All I need is a full-time stylist and I will be more diva-lishious than I already am, for sure. 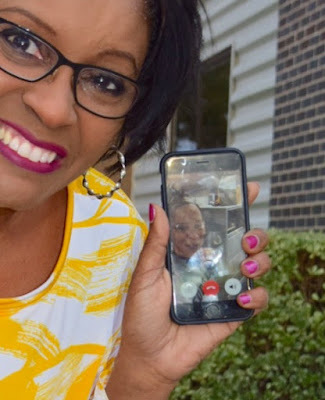 On another note: I hope you enjoy the new update and look of my online sewing space we call a blog….got a really nice lady off of the online store “Etsy” to pull it together for me. Her name is Chelsea with Bellaluluink. Don’t worry this is non-sponsored, I just really liked working with her. She made easy pudding of this mess of a blog I had going. Like I said before…I SEW, that is all. I do know my strengths. My new logo and business cards were designed by Dena Jackson Studio, a really talented lady and extremely professional. As well as with my skills and other areas in life, I try to improve and grow in knowledge and understanding. Yet there are times I respect the craft and delegate more difficult task to someone more able than myself. I have sought after professionals who’s skill sets far outshine my own. Anytime you have something or any services you like sharing on your blog, I am always grateful for the insight. Online reviews are very helpful. So, do tell about any services you have been keen to delegating to the more inclined mind. 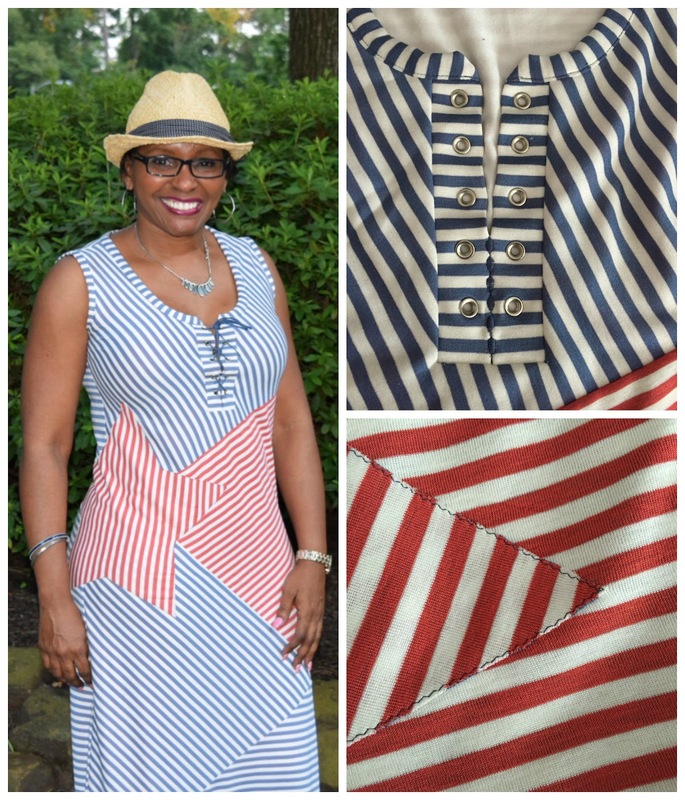 Was I thinking of Independence Day when I made this dress, was my mind set on the Stars and Stripes of our country? 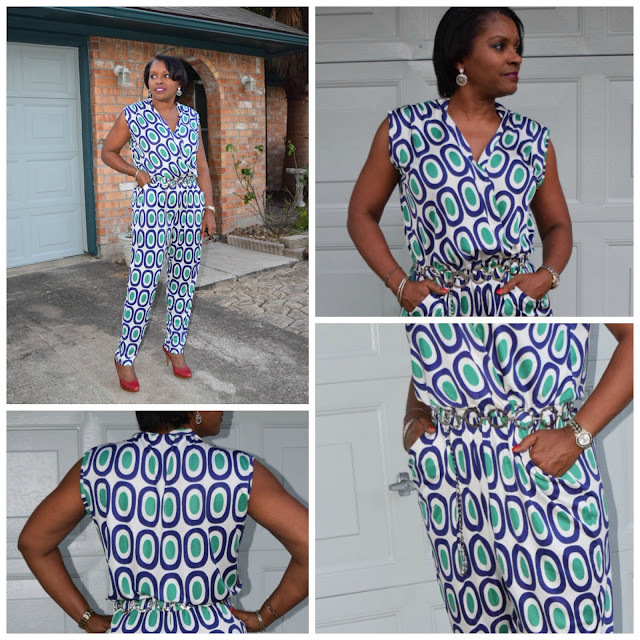 No, I was being me….just sewing because I liked the look of this fun design. McCall’s 6559 was the pattern I used even though I already have a few patterns for maxi dresses, but you would need to cut and add allowances, worry about placement and too many test fits and muslins in order to make it work. So why not use a pattern? Makes sense to me, right. The seaming was all over the place–from bias seams sewn along seams with straight of grain, it was very important to make sure to match the stripes only where it really, really mattered. Such is so with the side seams. I didn’t worry so much with the semi-bias and true bias seams. I made the placket front because of an idea I got from some current Michael Kors designs. Grommets and eyelets must be the new exposed zipper. The star for adhered after the right side seam was sewn before the lining was inserted. I used a spray adhesive to secure it before I used a simple zigzag appliqué to permanently secure it in place. There was no stretching using the walking foot. 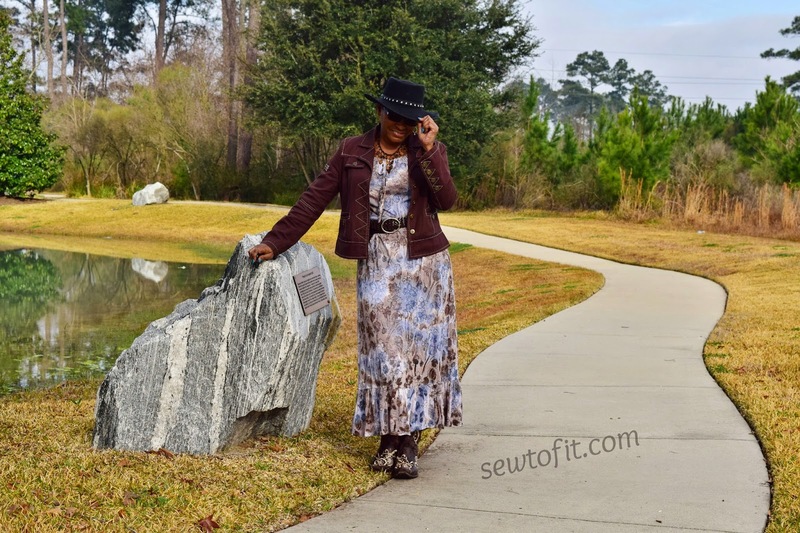 Listed as a “Very” close-fitting, pullover dresses. E and F: front seam detail, bias upper/middle fronts, and lower front/back (cut on crosswise grain of fabric. All have narrow hems. I cut a size 14 with a 1/2″ FBA and graded to a 16 at the hip front and added an additional 2″ to the “back” pattern piece at the hip. I have liked this dress design since it came out. The star and the mix of lines is what has always intrigued me. But until I found this fabric did I really want to make it. The star is what did it for me. 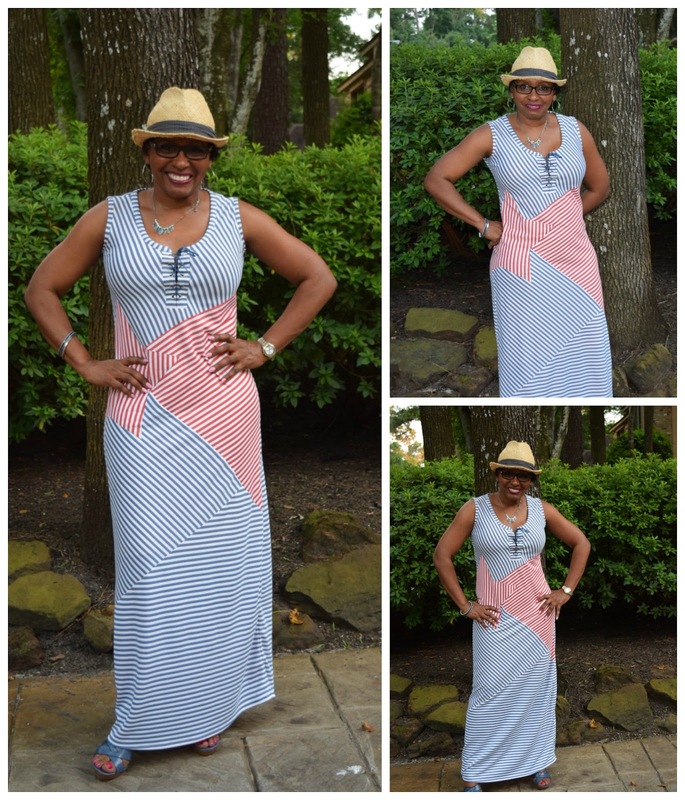 It is such a cute whimsical addition to a simple maxi dress. 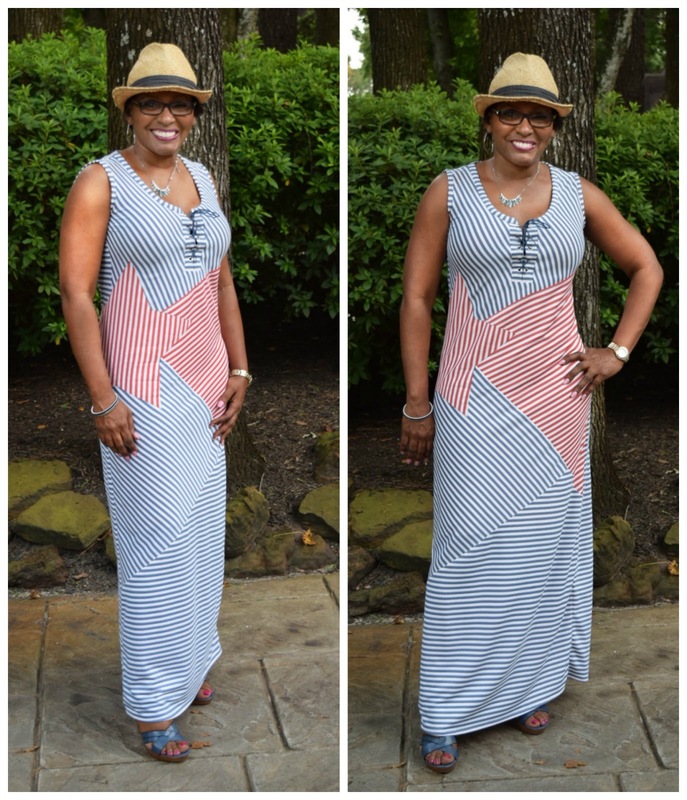 I even enjoyed having the stripes being reversible, which is really the fabric. This keeps it from being boring. Were the instructions easy to follow? I did not follow the instructions, and its not because I sew a lot, its just an easy sew. The neckline was changed substantially. Fabric Used: A reversible beefy Rayon Spandex blend can be found Here. 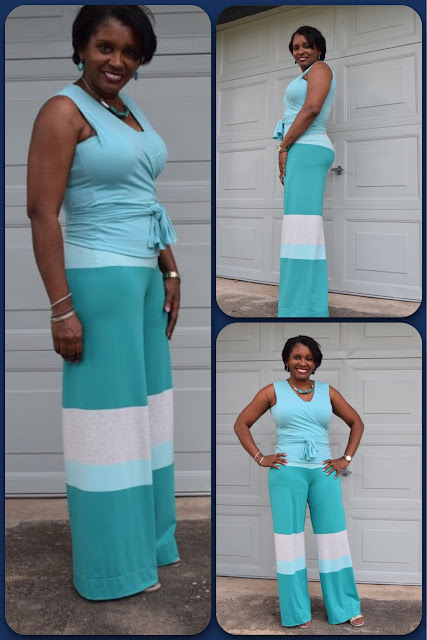 I lengthened it above the waist by 1″ and at the hem by 2″. 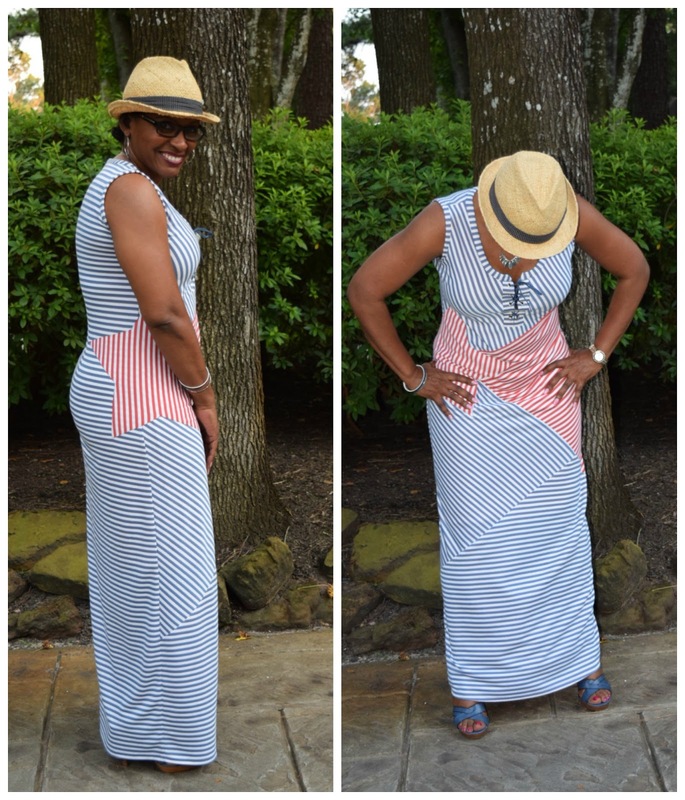 Next time I will give it another 2″ at the hem for heels. This dress runs short. I also narrowed the skirt by 2″ each side making it more straight instead of a-line. 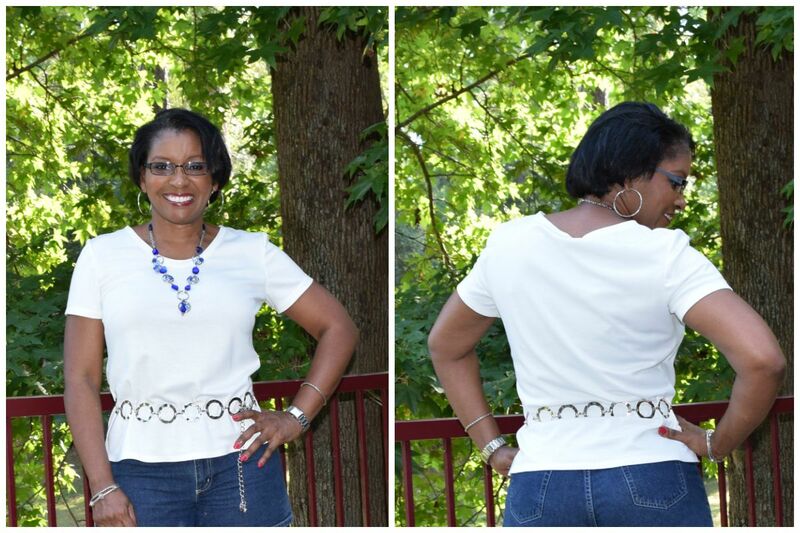 A double placket was added to the neckline to add some pazazz. Did I say season? Oh, yes, this is Houston, Texas. We have the Houston Livestock Show and Rodeo, better known as RodeoHouston, the world’s largest live entertainment and livestock exhibition. (wikipedia.com) RodeoHouston is only second to the International Quilt Festival. So, it is only right that I celebrate both in my Gringos and Cowboy Cowgirl hat, like baseball and apple pie, they go together during this time of year. The weather during Rodeo season is just as unpredictable as bronco busting, you never know which way the cowboy will be thrown, so we have to be ready for anything here. 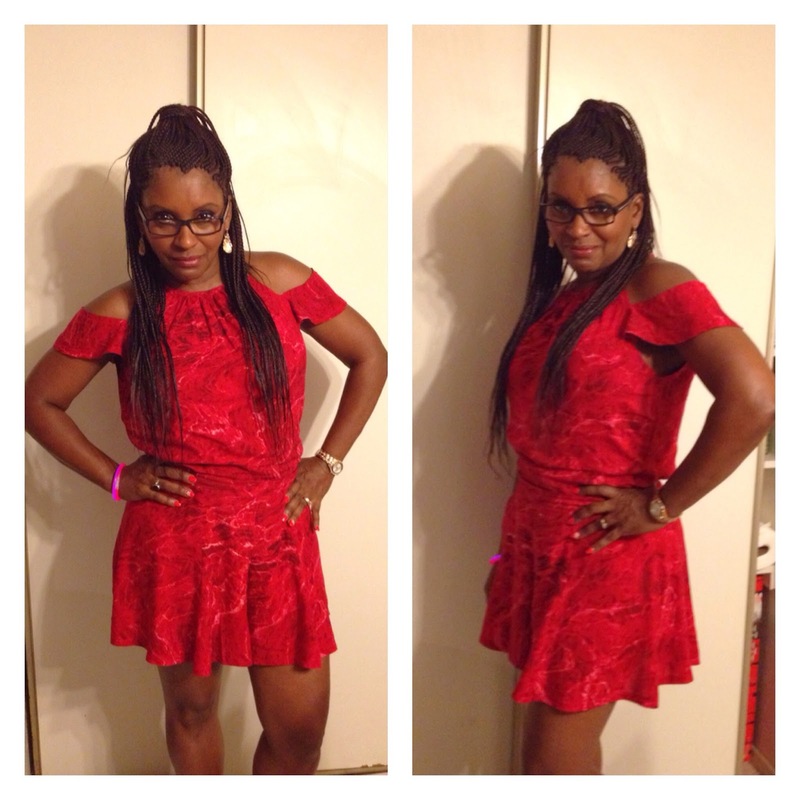 I decided to wear a simple dress I made to go with my boots or my house shoes, slippers to some of you. The day started with a bank of fog all over and a slight chill, and ended up by mid-morning at nearly 70 degrees. This is why we call it Rodeo season. 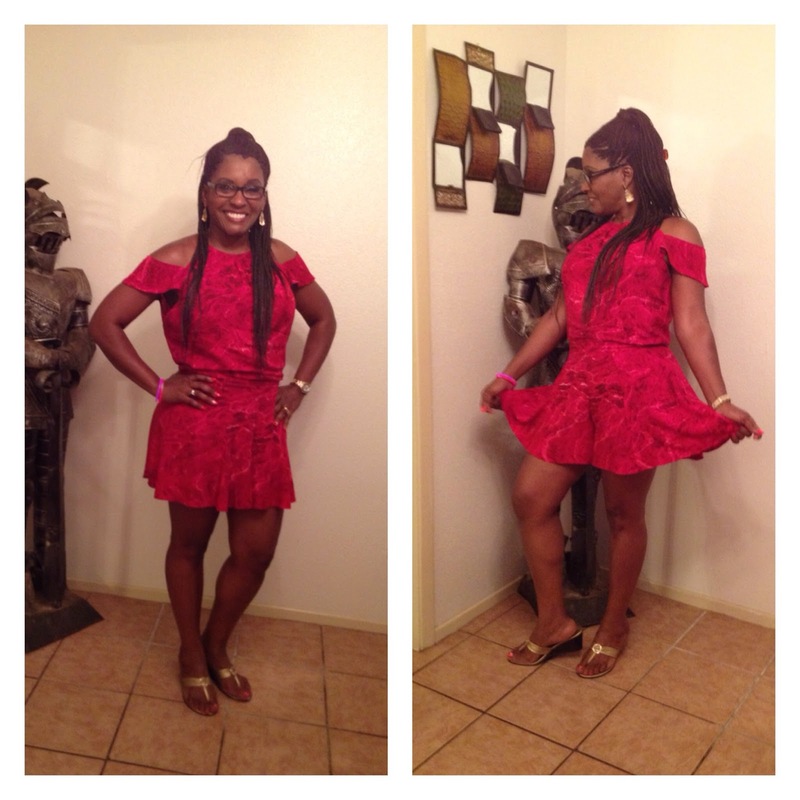 It’s quite fun dressing in Houston, because you can actually have the best of both worlds…excluding the summers. I get to sew summer clothes during the “Winter”. 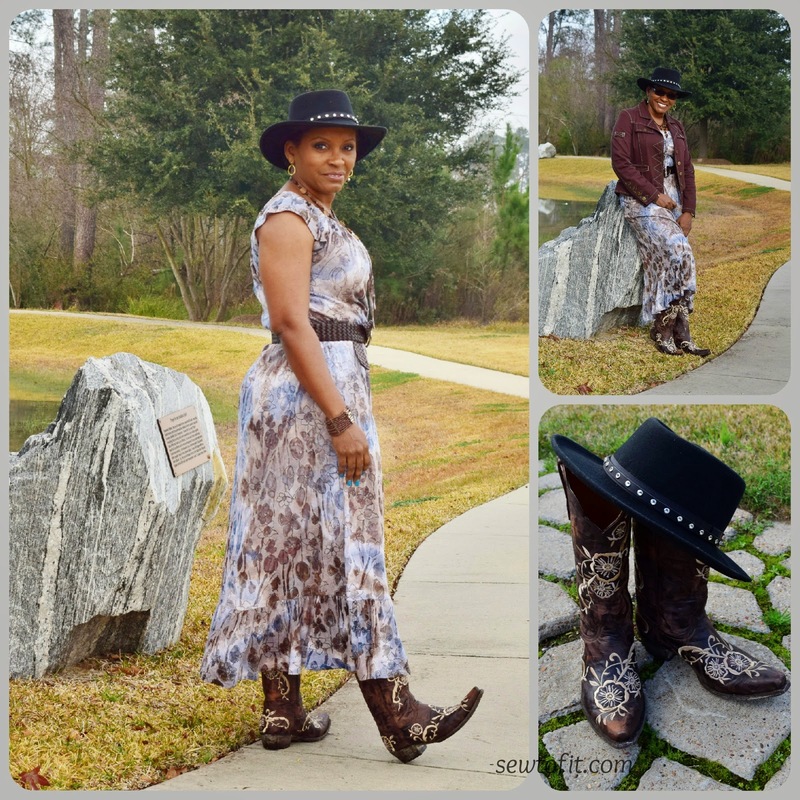 I made this dress from McCalls 6346, which is now out-of-print, but my lovely boots are new to my wardrobe. These Old Gringo boots, as they are branded, are the most comfortable I have ever worn. 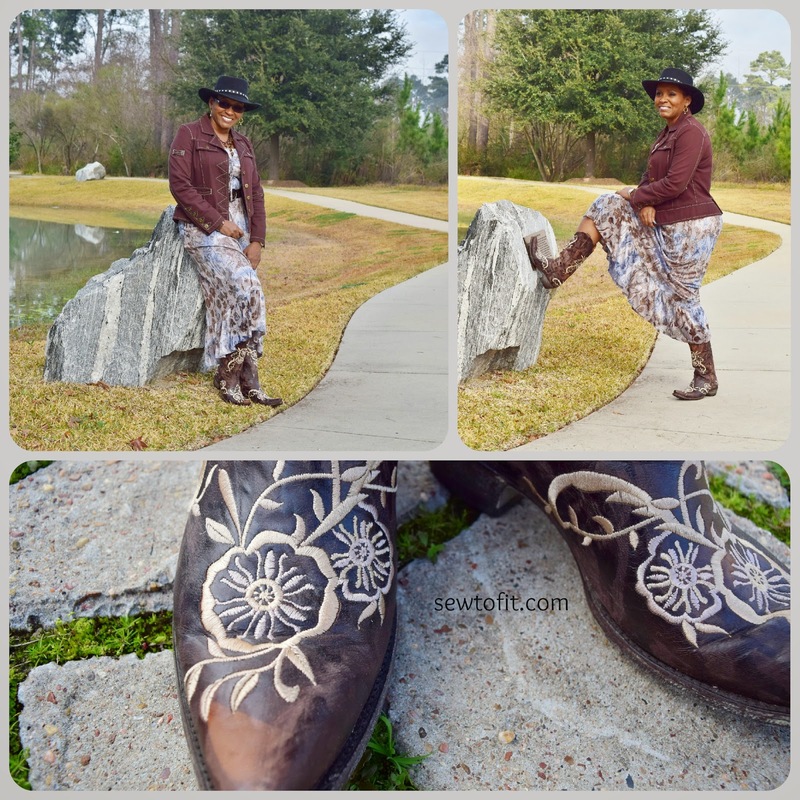 The website says: “Our distinctive style makes us a life style brand with a vast following unlike the average “cowboy boot” company. They have a “following,” now that is interesting. We all migrate at some point in our lives to a particular brand or style whether it be in fashion, cars, or sewing machines. We all have a preference. Why that is the case only we personally know ourselves, and explaining it is useless. I like sewing with Bernina sewing machines, and wearing Old Gringos, simple as that, no explanation needed. 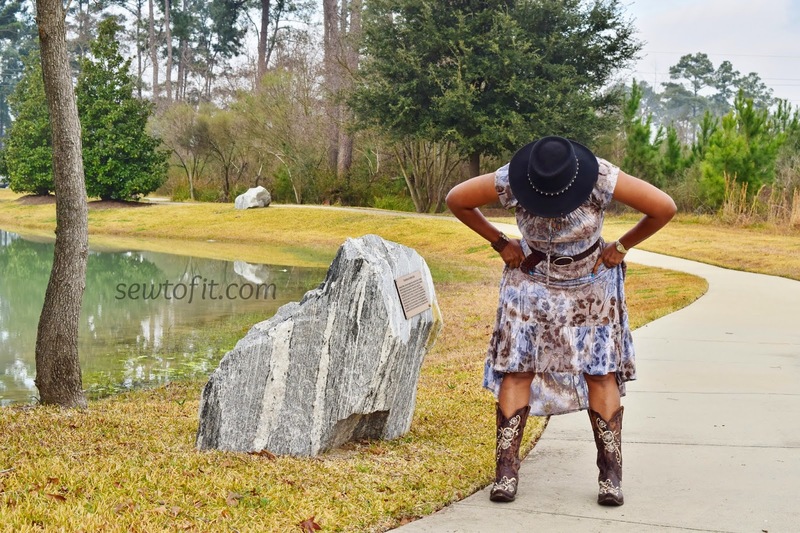 Out of curiosity, have any of you ever been to RodeoHouston or just plain enjoy wearing cowboy boots and hats during any season? Thanks to Rhonda for all her hard work in making this contest possible. 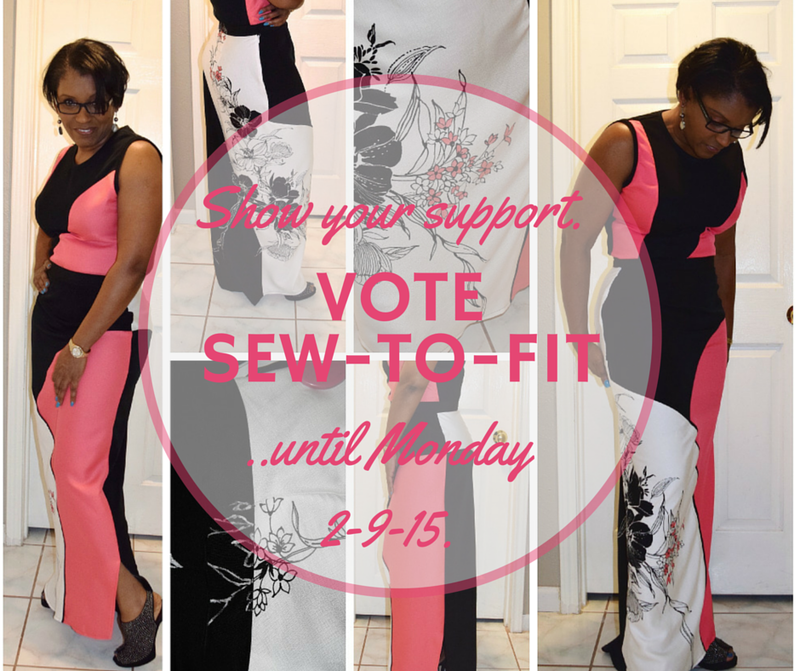 You can now vote on your favorite entry through Monday, February 9th. Of course, I know it’s me you can’t wait to vote for, so I made this fancy button to assist you. 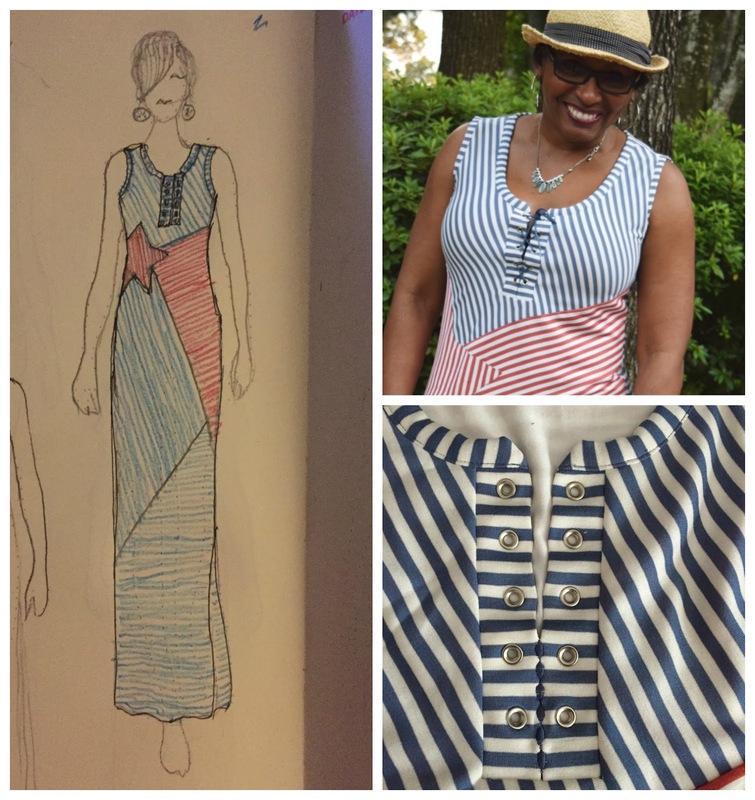 You can find the original blog post “Project Runway contestant or not?” here, explaining my complete process and inspiration for creating this lovely two-piece outfit. The fabric was the main reason and inspiration for the challenge. Click on the picture above or here. Cast your vote by clicking on the heart shape in the upper right of your selection. Everyone did such a wonderful job. If I weren’t a contestant, I would have a hard time voting objectively. What will I win? I get to win an online class from Craftsy.com and personal satisfaction for actually participating. Well, is that a win, or should I already have that. Anyway, it was fun. Why do I even list my post as reviews? At times it’s not to tell you what I think about the pattern, actually it is more of an Internet “Show (Sew) and Tell.” The enjoyment of sharing what I sew is more fun than you would ever know. Well, unless you sew as well and blog about it, or go to local guild meetings or sewing meet-ups to talk about sewing. 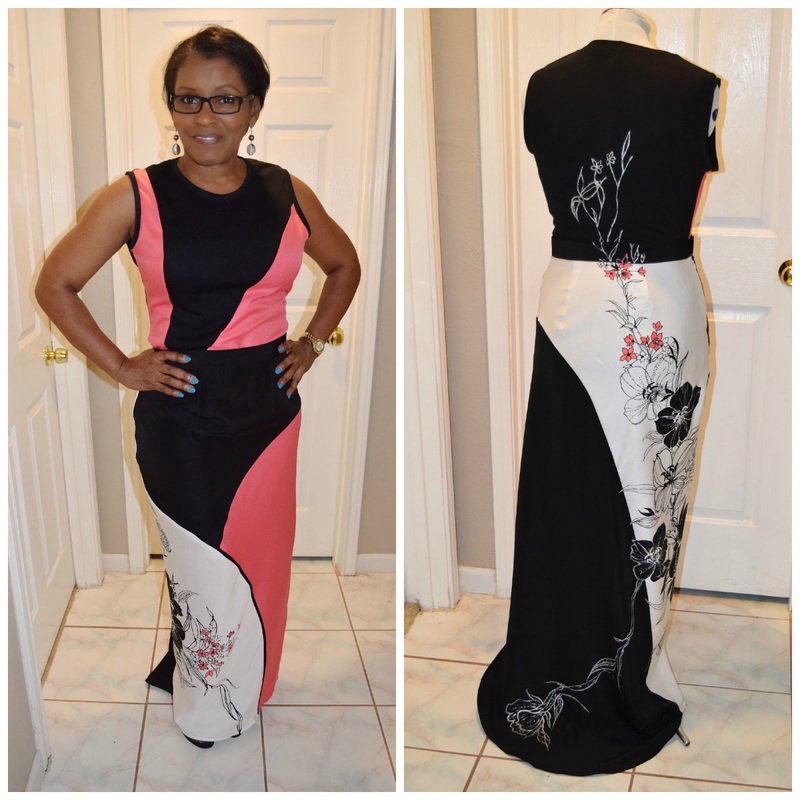 For the most part, when I sew, I just want to shout it to the world, “I MADE THIS MYSELF!! !” Now, mind you, this sharing is by choice to inform you via the World Wide Web, of my experiences which abound in the privacy of my sewing studio. I used to get that sharing satisfaction by sewing professionally for others, but that wasn’t enough. Especially, because that type of sewing limited my audience for “teaching” sewing, as well as limiting my time to actually sew for myself. I love to teach and share. Anytime I can tell the world about sewing, whether one person at a time, or in a group, I am in heaven on earth. That being said, shall we continue…. I made this cute little outfit to take on the look of a dress/romper/jumpsuit. Whatever you want to call it…it a short set to me. On the pattern envelope, the photos look as though there are pleats in the front, but it’s actually the draping that gives the affect of pleats. I made View B for myself, although the only difference in the views is the length. The flare starts at the hip line, which makes for an almost circle skirt. They had so much ease in them, you could almost cut three sizes smaller and just make up the difference in the waist seams. The pattern measures 53 1/2 at the hipline for the shorts, I am 43, and thus you can see how that would just be too much. I took out 7 inches of ease from 8 seams! (The pattern has princess seams in front and back.) The hem width on each leg was 44 1/2 inches!!! The bodice of Simplicity 2281 was used to create the top by lengthening it by 10″ and lowering the back opening by another 3 inches to compensate for not having a side zipper. There are no side darts, so to avoid the boxy look, I just curved the side seams slightly. No changes were made to the neckline, sleeves and shoulders. The drape of the sleeves are exaggerated due to the softness of the rayon fabric. Pattern Description says: Flared shorts and pants (very loos-fitting through hips) have contour waistband, princess seams, back zipper, and narrow hem. 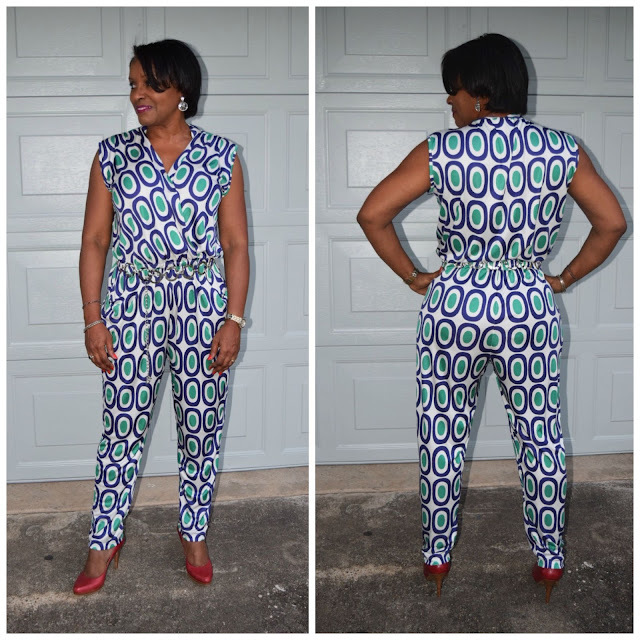 NOTE:– the waistband did not seam contoured as much as it might appear on the pattern. Fabric: Rayon challis from my stash–so old I don’t remember where I bought it. 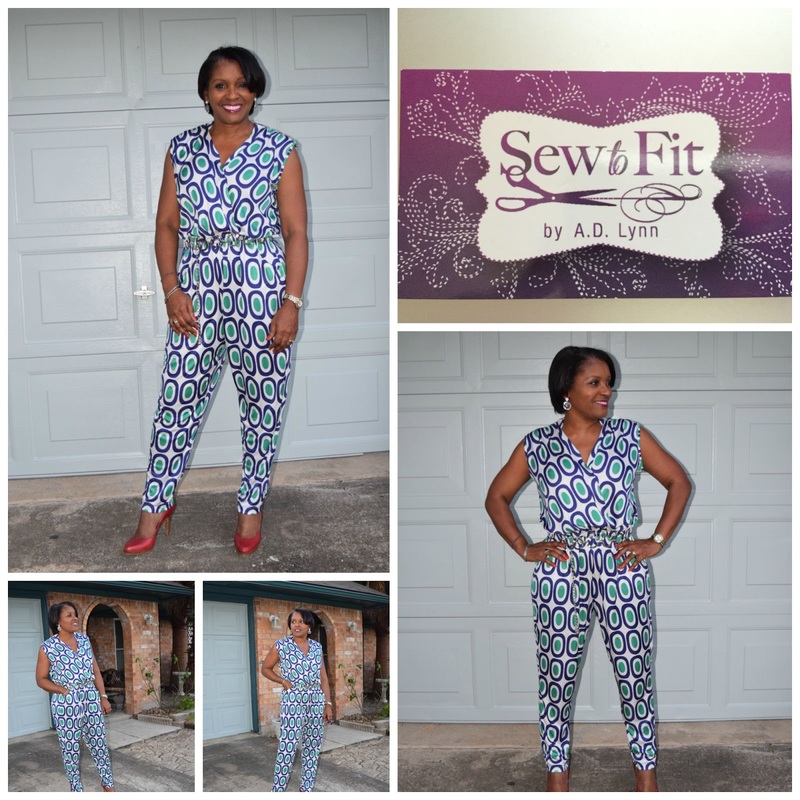 Alterations Note: The reason I cut a size 16 was to get the correct fit of the crotch and waist because it matched my pant sloper. After satisfying that prerequisite, I then made the changes in the seams to get the fit and flare I wanted in the hips. I found it easier to fold out width and skimmer off the seams, than to redraw or deal with the crotch curve, which was perfect for me. I did lengthen the shorts about 2 inches. 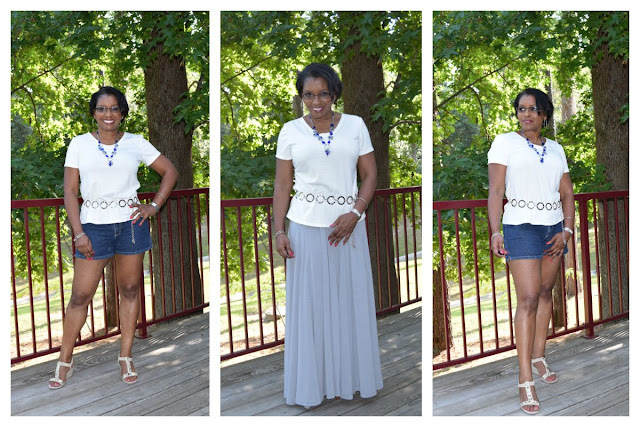 I think these are the cutest culottes/shorts for any age. 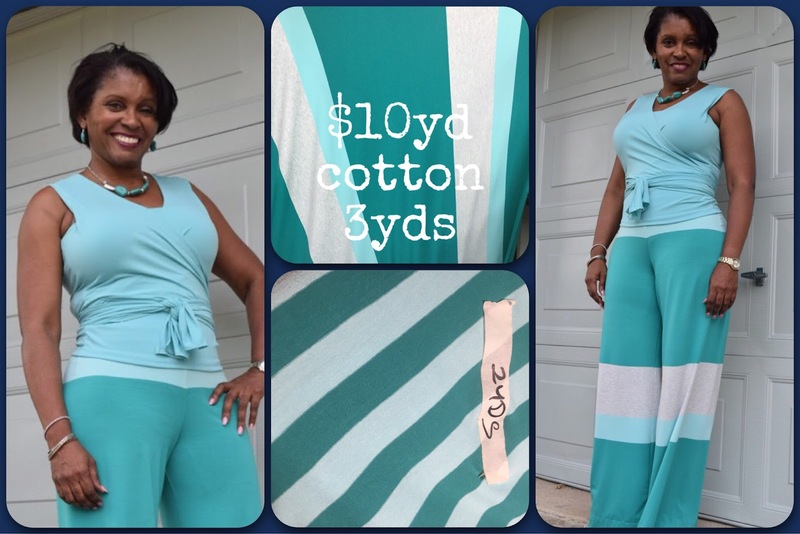 Next, I’ll be making the palazzo pants. Although, I know I will be removing so of that ridiculous ease. Often times I have to get out of my box of simple style and symmetrical silhouettes. It seems that when a garment is not even or symmetrical on both sides for me, I have a hard time feeling comfortable. Another, fashion trend that is new for me is to use large print graphics. However, after reading my regular blog roll, I was so inspired by the top Cennetta over at Mahogany Stylist shared with us. Graphic prints! Ok, I might be able to do this. I found what I was looking for when I came upon the stash that Natasha at Sew Crafty Chemist shared. This top was a true inspiration item, brought on as I continued to scour the net looking for ideas for a garment I would be comfortable with, and a graphic print fabric which I could get excited about and actually be able to wear considering my tendency towards humdrum prints and solids. Sew Crafty shared this print she had gotten via mail order. I wanted that print, but I hate mail order fabrics, I like to “touch” the fabrics I purchase. Is anyone else like that? However, SMFabrics Online store is here in Houston, so when I have the urge to touch, I can set an appointment to visit the warehouse. The best of both worlds. I found this particular fabric at Fabric Depot, while on a trip in July. I couldn’t wait to get back home to sew up something, anything! But, I had to lay this fabric out and admire its graphic, and allow it to “speak” to me and tell me what it wanted to become. It just seemed right, to use McCalls 6797, like a match made in fabric heaven. My fabrics speak to me all the time, however, sometimes I just don’t listen and end up with duds. Wouldn’t you say your fabrics talk to you? Not much to it. 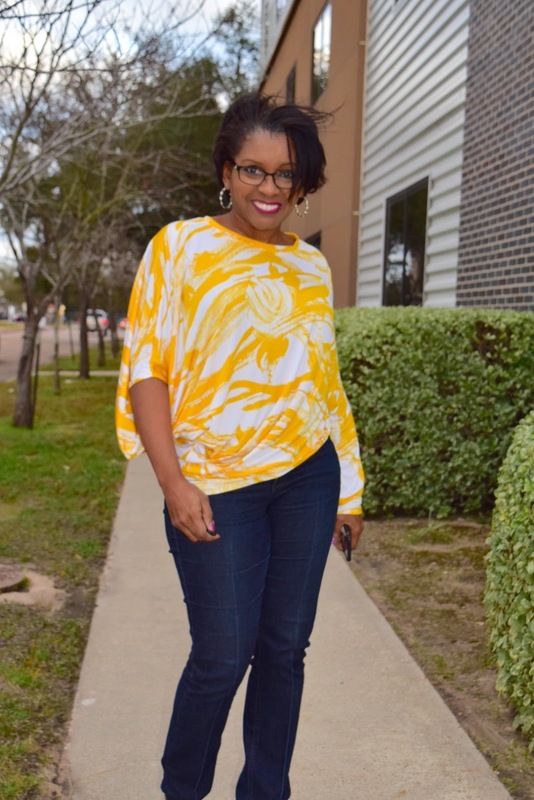 Pullover tops (loose-fitting through bust) have neck band, front/back extending into right sleeve forming drape, shaped hemline and narrow hem. A: armhole band. Let’s talk about the sleeve and armhole- The sleeveless side is GREAT! I love the way it hugs the body and curves right in under the arm. Now the other side, not so much. It just showed too much when the arm is raised. So here, I sewed up the edge about 6″inches, thus, creating a type of pocket under the arm. Problem solved. No alterations were made, although a 1″ FBA would have been useful in order to avoid crawling of the front towards the sleeved side. I should have also widened the bottom opening a little so it would drape more freely over my hips. I cut a straight Medium. I tried it with the sleeve as well, but I wasn’t happy. The final verdict…I will definitely make another. Just have to wait for another “wow” fabric.